Now, the GOP vice presidential nominee and his priorities are facing a critical test as Donald Trump, staggered by his recorded vulgarities about women, careens toward Sunday’s presidential debate against Democrat Hillary Clinton. Trump has vowed to stay in the race. Pence’s advocacy for Trump came to a screeching, perhaps temporary, halt Saturday in the hours after Trump released a video apologizing for 2005 remarks in which he describes his aggressive conduct toward women. “We pray for his family and look forward to the opportunity he has to show what is in his heart when he goes before the nation tomorrow night,” the Indiana governor said. It’s more evidence of the trials facing the GOP’s No. 2 that could serve Pence well if he runs for the top spot in 2020. Pence dare not speak about that possibility. To do so would assume Clinton prevails on Nov. 8. But plenty of people are engaging in presidential talk about Pence, including Republican members of Congress, governors, a former presidential candidate, and more. Sens. Mike Lee of Utah and Mike Crapo of Idaho are calling on Trump to quit the campaign so Pence can lead the ticket. Sen. Kelly Ayotte of New Hampshire says she’ll write in Pence’s name on the ballot — not Trump’s. Pence canceled his appearance at a Wisconsin rally Saturday with House Speaker Paul Ryan. Pence would have been expected to advocate for Trump. 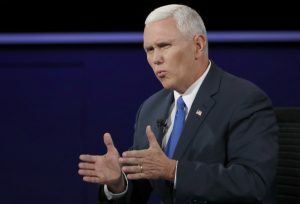 Pence raised his political stock Monday night during the only debate against Democrat Tim Kaine. During the 90-minute event, Pence managed to not defend Trump’s indefensible behavior, yet still sound supportive and show off his own expertise on foreign policy. The performance highlighted the gulf in political sophistication between Trump and his running mate. Pence addressed the awkwardness with a savvy statement acknowledging his own performance and preserving his alliance with Trump. But on Friday, Trump’s behavior put Pence to an even tougher test. The Washington Post and NBC broke the story of Trump’s words about women as Pence advocated for Trump him in Ohio. “With Donald Trump as president, we’ll have a president of the United States who respects all the American people,” Pence said as news of Trump’s comments was breaking. Pence ignored shouted questions about Trump, and he was quickly whisked out of reach of the news media. What followed: Pence’s silence, the scrapping his Wisconsin appearance and finally, his statement. The election is bigger than that, said Bopp, a lawyer from Terre Haute, Indiana. Associated Press writers Brian Slodysko and Bill Barrow contributed to this report.